What would your private jet look like? August 01, 2018, 12:01 p.m. If you don’t like the sound of travelling for work, best not become a politician. Theresa May has made 48 trips to 26 countries since becoming Prime Minister in July 2016, and Donald Trump has made 21 trips since starting his presidency in November 2017. The only perk is arguably the private jet. No need is met unmet on board the jets of the most influential politicians – a Daily Mail article recently revealed Donald Trump and Vladimir Putin’s planes boast king-sized beds, gyms, and in Trump’s case, even an on-board medical suite. YouGov research reveals what features the British public would want on their own private plane. Respondents were given a list of features inspired by the US and Russia’s government planes, and asked which they would want on board their own plane, were they to have one for business purposes. The most popular features for a private plane among Brits are a king-sized bed and luxury bathroom, seen as must-haves by over half of respondents (54% and 53% respectively). Two fifths (41%) would like a spacious office, and just under a third (30%) want a dining room on-board. Just over a quarter (27%) would install a sound-proof conference room, and a fifth (21%) would go for an on-board medical suite. The most unpopular feature in Trump and Putin’s planes is the gym, with just one in eight Brits (13%) keen on having one on their own private plane. Then again, is travelling for work really as glamorous it sounds? Not necessarily: between the 6:00am flight and the 11:00am meeting, you’ll barely get a chance see where you’re going through the window of the cab before you’re back on a plane again. So if you’re able to afford a private plane, and don’t have any world summits to attend, it might be worth considering a private yacht instead. Over two fifths of Brits (44%) would prefer a private yacht to a plane, with just one in three (34%) preferring a plane. 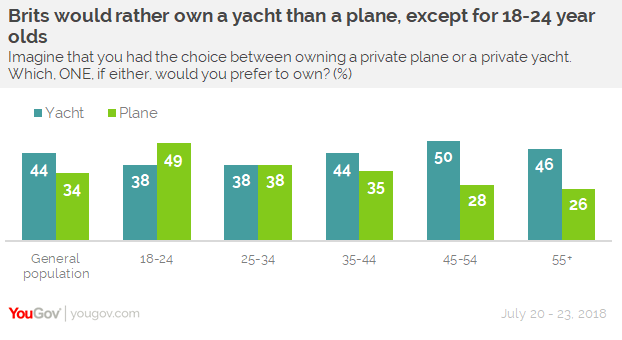 18 to 24 year olds are the only age group more likely to want a private plane (49%) than a private yacht (38%), and the least likely age group to choose ‘neither’ (13%, compared 22% of the nation as a whole).